Spectro Cleanser for Blemish-Prone Skin is a gentle, non-irritating cleanser specifically formulated for acne-prone or blemish-prone skin. Also a good choice for skin that is normal to oily. Deep cleans to remove impurities such as dirt, oil and bacteria while protecting your skin’s natural moisture barrier. Use morning and night as part of your skin care routine to help maintain clear, healthy-looking skin. 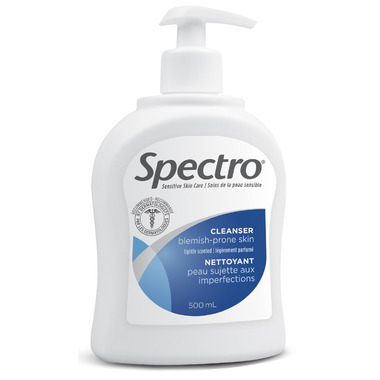 Follow with Spectro® Daily Facial Moisturizer for Blemish-Prone Skin. This product is pretty amazing! I have been using it for years now. I was first recommended by a Pharmacist to try this out for my acne prone skin and because I have very sensitive skin I found this works. I haven't used a bar of soap on my face in years. The product works very well, but it not a full cure for acne as is no product on the marker. I still get breakouts on my face every once in a while, but I would have more if I used soap. I generally use the amount the size of a quarter and lather up my face. With this amount you can do the whole face. I usually rub it in for about 30 second or so on each section of my face as per the bottle. I rarely have to buy a new bottle of this stuff. It lasts forever as I use a small amount everyday. If you want a great easy to use tool in the fight against acne, this is the one I would recommend highly!